After a good first quarter in fiscal 2016, the technology company Continental is raising its forecast for free cash flow before acquisitions for the year as a whole: “In the first few months of this year, we again managed to achieve a considerable increase in free cash flow before acquisitions. By the end of the year, this figure is expected to climb to at least €2 billion. We had previously expected a figure of at least €1.8 billion,” said Dr. Elmar Degenhart, Continental’s chairman of the Executive Board, at the presentation of the business figures for the first quarter on Wednesday. In the first quarter of 2016, the automotive supplier, tire manufacturer, and industrial partner boosted its sales by three percent year-on-year to €9.85 billion. At the same time, net income attributable to the shareholders of the parent rose by 12 percent to €734 million. Earnings per share rose to €3.67 after €3.28 in the same period of the previous year. As at March 31, the operating result (EBIT) had increased year-on-year by 6.4 percent to over €1 billion. This equates to a margin of 10.6 percent compared with 10.2 percent in 2015. Adjusted EBIT climbed by 8.4 percent year-on-year to €1.1 billion. At 11.3 percent, the adjusted EBIT margin was therefore 0.7 percentage points higher than the level for the first three months of 2015. “Our strong cash flow enabled us to reduce our net indebtedness in the first quarter of this fiscal year by €459 million to €3.1 billion overall, compared to the end of 2015. The gearing ratio thus came to 23.1 percent. This means we have almost achieved our medium-term goal of getting this ratio below the 20-percent threshold,” explained Chief Financial Officer Wolfgang Schäfer. Compared with the same period of the previous year, net indebtedness was even €1 billion less. Net indebtedness had increased in the first quarter of 2015, primarily as a result of the acquisition of Veyance Technologies. At the end of the first quarter of 2015, the gearing ratio was still at 33.5 percent. As at March 31, 2016, Continental had a liquidity buffer of €5.45 billion, comprising €1.7 billion in cash and cash equivalents and €3.8 billion in committed, unutilized credit lines. The revolving credit line of €3 billion concluded in April 2014 (part of the syndicated loan with an originally committed total volume of €4.5 billion) was extended for a further year in April 2016. This financing commitment is now available to Continental until April 2021. The term loan of €1.5 billion included in the syndicated loan was fully repaid early by the end of March 2016. Interest expense totaled €59 million in the first three months of 2016. “At €34 million, interest expense resulting from bank borrowings, capital market transactions, and other financing instruments was €14 million lower than the prior-year figure. The major portion related to expense of €21 million from the issued bonds," Schäfer explained. Net interest expense improved by €22 million year-on-year to €34 million in the first quarter of 2016. In the first three months of the year, Continental invested a total of €398 million in property, plant and equipment, and software. The capital expenditure ratio thus amounted to 4.0 percent after 3.7 percent in the comparative period of the previous year. Continental increased its research and development expenses to fund the start of numerous projects. Compared with the first quarter of 2015, this figure went up by 11.4 percent to €716 million. This corresponds to a ratio of 7.3 percent of sales after 6.7 percent a year ago. 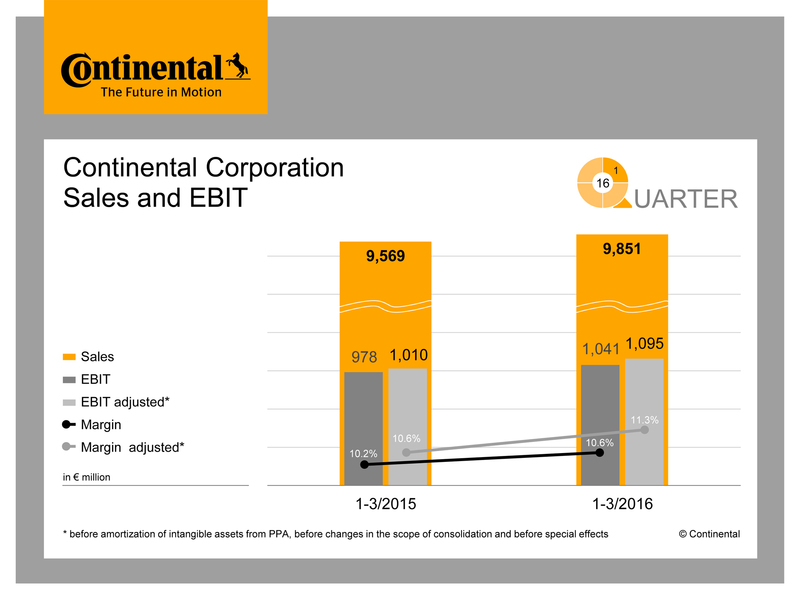 At the end of the first quarter, Continental had 212,417 employees, which is 4,500 more than at the end of 2015. This is attributable mainly to the further expansion of production capacity, sales channels, and research and development. In the first three months of this year, the Automotive Group achieved sales of €6.0 billion. The adjusted EBIT margin was 7.6 percent. In the first quarter of 2016, the Rubber Group generated sales of €3.85 billion and increased the adjusted EBIT margin by 3.1 percentage points year-on-year to 17.8 percent.